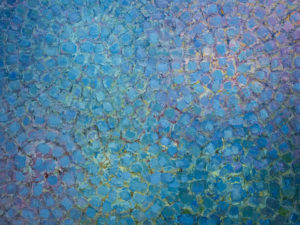 James Harris Gallery | Eric Elliott, "Pairings"
James Harris Gallery is pleased to present the fourth solo exhibition by Seattle artist Eric Elliott. Elliott’s paintings are defined by a thick impasto that depicts a traditional subject: the still life and the artist’s studio. It is in the artist’s hands that common everyday objects become an investigation not only of the viscous nature of paint but also light, atmosphere and composition. The exhibition titled Pairings showcases Elliott’s interest in collapsing the visual cues of observational painting in which some works are more realized while others are pushed toward abstraction. The exhibition will consist of groups of two and three paintings that demonstrate his interest in the conventions and boundaries of representations. Elliott uses light as a tangible object, giving it as much weight as the physical objects themselves. In the past, the artist very intentionally used grey tones to capture the natural lighting of the Pacific Northwest. 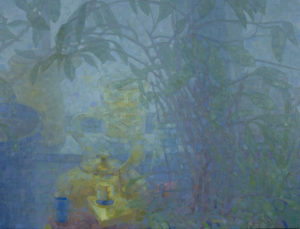 Now Elliott has shifted his palette to bright color to reflect the intensity of direct sunlight streaming through his studio window. 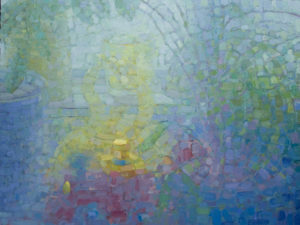 In a sense, the paintings act as windows or glimpses into the artist’s personal world. 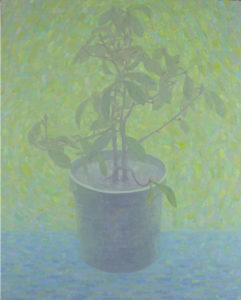 One painting titled “Photinia with Green Background” depicts a common house plant centered on a blue table top. The leaves, stems and plastic pot are beautifully rendered. Multiple hues of green and blue brushstrokes swirl around the plant activating the paintings surface and creating a central focal point. Paired with this work is a small painting in which the centralized form has been pushed into complete abstraction with thick impasto. 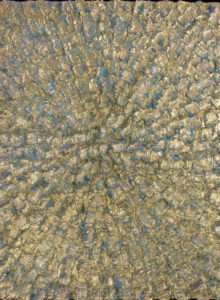 Green and blue flecks of color emerge underneath glinting gold pigment. 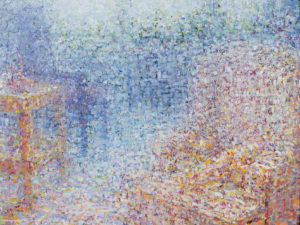 Elliott’s heavy application of paint emanates out from the center in a radiant pattern of brush marks completely destroying the recognizable form. These two paintings epitomize Elliott’s artistic practice; centered on the tradition of realist painting but pushing it beyond the conventions of representation. His expressive handling of paint allows him to concentrate on the autonomy of the each object and how they inform one another. 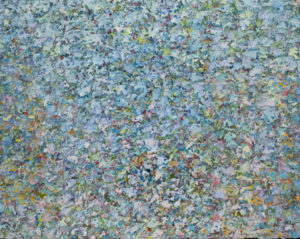 The subjects hover between dissolution of form and the clarity of observation.